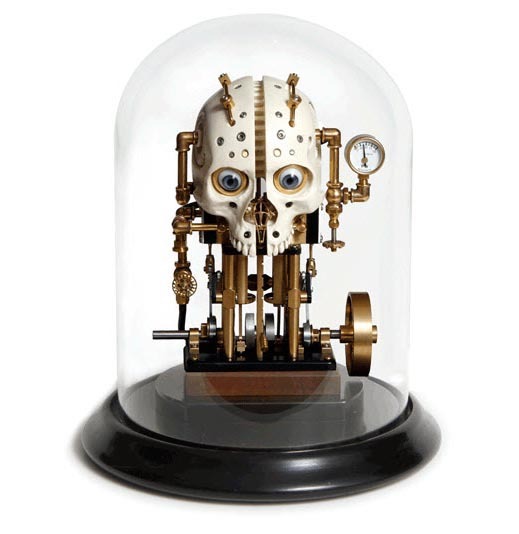 AFA and Steampuffin are pleased to present “Steampunkinetics,” an exhibition of over forty kinetic sculptures by eighteen artists inspired by and entrenched in the Steampunk aesthetic. Some functional, some frivolous, and all fantastical, the works in this exhibition include lighting, furniture, time machines, submarines, airships, musical instruments, gizmos and gadgets […] An emerging art movement, a creative design solution, a community and a culture; Steampunk is part philosophy and part Victorian Industrial aesthetic. It is a re-imagining of two distinct time periods and the fanciful and functional inventions that are produced. What if the Victorian or Industrial age happened at the same time as our modern or information age – what would have been produced in inventions, innovations, art and gadgets? That is Steampunk. The exhibit is open until September 2nd and if you are in NYC, you have to see it!